Did you know that when drywall was invented by the U.S. Gypsum Company in 1916 – nobody wanted to use it? It was considered “cheap”. A star is born: It wasn’t until the US’s entry into World War II created the need for quick, inexpensive building materials to offset labor shortages and war costs that this now “common” product got its opportunity to shine. Using drywall was soon regarded as patriotic, allowing citizens to spend more time and money supporting the war effort. 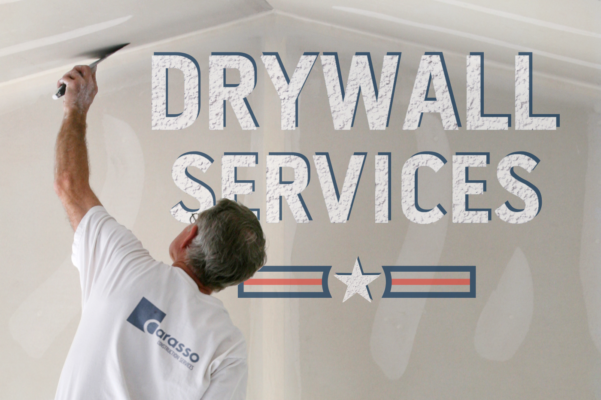 As a full-service drywall contractor, the Carasso pros offer expert patch & match mending, drywall installation, drywall finishing, texturing, water damage repair, stud framing, insulation and custom painting. "job was handled exactly ..."
"Thank you for the quick, professional job your crew completed this week. The job was handled exactly the way you described that it would be. The work is beautiful and I look forward to seeing your crew again."